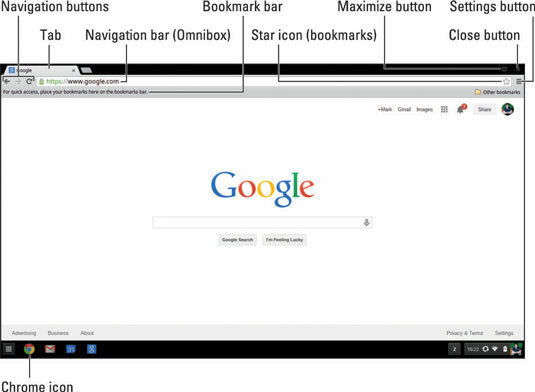 Chrome’s Omnibox and navigation buttons allow you to surf the web. They’re located at the top of the Chrome browser window, along with bookmarks and other buttons. See this figure for details. In non-Chrome web browsers, the Omnibox is known as the address bar. This is where you type the address (or URL) for the website you desire. In Chrome, however, you can enter more than just addresses — you can now enter search queries. This is why Google calls this space the Omnibox: Chrome treats any non-URL term entered here as a search query and submits it to your default search engine (which is Google, of course, unless you specify otherwise). Back: Allows you to navigate to the web page that you were on previous to the current page. Forward: Takes you forward one page in your browser history. Chrome isn’t psychic, however; this button remains grayed-out and inaccessible until you’ve used the Back button. Go backward one page, and clicking the Forward button returns you to your original page. Refresh: Reloads your current page. Sometimes you might want to use the Refresh button to load new information that may be in process of launching. Have you ever been waiting on a ticketing site for concert tickets to go on sale? You might hit the Refresh button over and over again until the purchase button is activated.